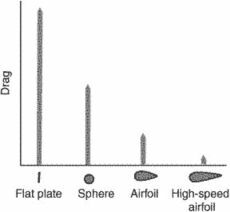 That part of the airfoil drag that results from the skin friction and the shape of the airfoil as indicated by the airfoil profile. Streamlining reduces profile drag substantial. The combined effect of form drag and skin friction. It is total drag less induced drag. It is a type of parasite drag that increases as the square of speed and is dependent on the shape of the body and its smoothness. See also form drag and skin friction. When the angle of attack is increased (deceleration of the flow), the separation point moves to the leading edge of a blade, and during decrease in angle of attack (flow acceleration), it moves to the trailing edge, and correspondingly the coefficient of grid profile drag [C.
In general, the matter at hand is not about researching the influence of the change in the Strouhal number on the instantaneous values of lift and profile drag coefficients or flow deflection angle and coefficient of total pressure loss that characterise the efficiency of compressor grids but is about researching the influence of the Strouhal number on the display of hysteresis in the performance of compressor grids. It computes side-force lift, vortex drag, profile drag, weight, center of gravity location as measured from the root leading edge, center of gravity as measured vertically from root location, and other performance parameters.